Posted on Thursday, May 1st, 2014 at 10:23 am. TaiwaneseAmerican.org and the Formosan Association for Public Affairs’ Young Professionals Group (FAPA-YPG) are pleased to announce the 1st place winner of our recent “Designing Taiwan” Art Contest: Tracy Chen of Fremont, CA. We received so many impressive and inspiring submissions, which made the judging challenging for our panel of five guest judges from multiple community organizations. Tracy’s design, however, was consistently highly-rated and praised for its quality, theme, and potential to engage a broad audience. Tracy will receive the $1,000 Grand Prize. Congratulations, Tracy! During Asian American and Pacific Islander Heritage Month and Taiwanese American Heritage Week this May 11-18, 2014, we invite you to share, print and display this poster anywhere you see fit. 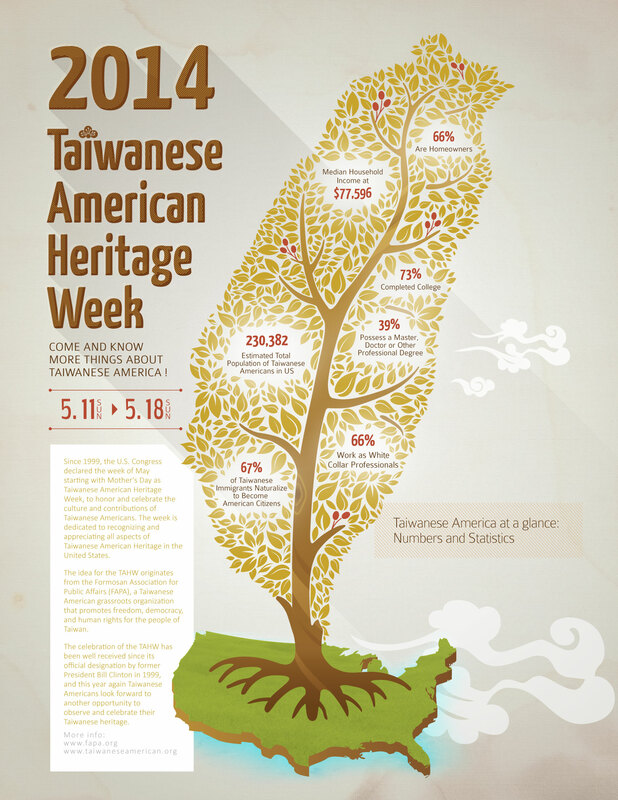 2014 Taiwanese American Heritage Week Poster. Design by Tracy Chen. It’s simple to print on standard 8.5″x11″ paper from your printer! I am Tracy Chen (Chen Yi-Chun 陳怡君). I have worked in advertising agencies in Taiwan for 7 years as a graphic designer and project manager; my client lists cover from fashion, technology, biotechnology to publishing industries. I did lots of commercial design in the form of graphic design, web design, corporate identity, package design, etc. However, I am enthusiastic about animation and I had hoped to continue producing animation as an expertise. Therefore, I came to the States in 2009 to explore this most amazing field in the entertainment industry. I graduated from Academy of Art University in the major of Animation and Visual Effects in 2012. While I learned advanced skills and knowledge about animation, I did some freelance projects for U.S. and Taiwanese companies sometimes. Although I learned lots of skills of making animation and Visual Effects, I still have a strong passion for graphic design. Right now, I am a freelancer doing both animation and graphic design works while expecting my first baby due in late-July. I started to fall in love with infographics these days and wondered if I could use this way to make people know more about Taiwanese Americans with a simple image. Therefore, I started to collect information about Taiwanese Americans and found out that Taiwanese Americans are truly outstanding compared to other Asian Americans according to the 2010 U.S. census report. I came up with a picture in mind that Taiwanese Americans standing on U.S.’s land are growing fast and flourishing in all aspects. We should be proud of being Taiwanese American based on its impressive picture. What is your favorite part about Taiwanese culture or being Taiwanese? Definitely the food and the food culture. I’m a greedy woman in terms of Taiwanese food. I love Lunar New Year so much because my parents and relatives will prepare many delicious cuisines during the festival. Meanwhile, we could have mutual care and support for every family member when enjoying a family reunion dinner. My favorite drink is black milk tea (金香奶茶) from Ten Ren Tea (天仁茗茶) in Taiwan; they offer good quality tea and milk that other bubble tea chain stores could not compete with. I also love Two Peck Chicken Pie (派克脆皮雞排), which provides super crispy and juicy fried chicken cutlet. You’ll feel pretty satisfied if you enjoy the milk tea and chicken cutlet at the same time. Just want to make sure, so we can use these on our facebook to promote TAHW?